Almost every American remembers the tension that was lived during the Gulf War. Even though most of the actual combat was held in the Middle East, Americans were witnesses of the destruction that took place during the war. During this time, a highway that went from Kuwait to Iraq became known as the Highway of Death, because of the multiple attacks that took place on February 26 and 27 of 1991. There were hundreds of cars that were destroyed on site, along with the people that were inside. Hence, the road received the name of death because of the numerous victims that perished that day. There are many people that are superstitious, and there were far too many that cried out at the fact that the Highway of Death was composed of two roads: Highway 80 and Highway 8. While it's true that the highways were chosen by the U.S., it's rather bizarre that they both carry the number eight in their names. The first Highway of Death was actually blocked by the marines, capturing a group of Iraqi military men. 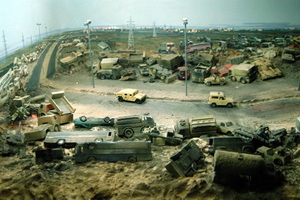 The problem here was that hundreds of vehicles were also captured, becoming targets of the attacks that came afterwards. Nonetheless, there was a section of the road where the drivers and occupants simply fled and left their cars. This section was later nicknamed the Mile of Death. Some say there were more than 300 vehicles left in the traffic jam. Highway 80 – or Highway of Death – happens to run from the well-known Kuwait City, all the way to Basra, which is just in the southern area of Iraq. This famous Highway of Death is actually a large road composed of six lanes. It became extremely well-known all over the world because this is the place where U.S. forces attacked the Iraqi Army. There were hundreds of drivers trying to get from Kuwait City all the way to Basra, and vice versa. According to the statistics of the Gulf War, there were between 1,400 and 2,000 vehicles that were on Highway 80, and perhaps an additional 400 to 700 vehicles on the side that led to Basra. Even though many people were capable of escaping, numerous others fell dead on the site. There isn't a number that reveals exactly how many people died on the Highway of Death. After the attack on the Highway of Death, numerous claims started to appear where they accused the United States from being out of place. Some say that the decision of the U.S. to attack on Highway 80 was unequal because Iraq had already started to remove their forces from Kuwait. Others say that it was well within the means of combat because they were holding innocent children and women as hostages. According to the very same U.S. Attorney General from the time, the attack happened to be in violation of the Third Geneva Convention because the Iraqi soldiers were not in combat. To this day, it isn't known how many Iraqis lost their life on the Highway of Death.